All Macs are able to charge Apple iDevices via USB port. However, majority of PC are unable to charge the Apple iPad because its USB ports do not provide enough power for charging. So you will see "Not Charging" message in the status bar after plug in to a USB port. The solution is a free Windows utility called Asus Ai Charger that allows you quickly charge iPod and iPhone which Asus claims 50 percent faster. Initially, this software increases the wattage in USB port to charge Apple iDevices even faster. In a sense of having higher wattage, now it can provide sufficient juice for the iPad which requires 10 watt of energy to recharge. Download Asus Ai Charger. You don't really need to have a Asus PC/Laptop, this software works on most of the PC. Install it and you're ready to go. Asus Ai Charger has no settings nor user interface. 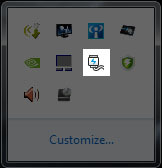 It just has an indicator/icon in Windows system tray showing the status of charger. I have installed it and using for months on my Asus N53S laptop charging iPad and iPhone without issue. But Keyable.com kindly warns use it at your own risk.